Who can resist the tasty Jelly Belly Jelly Beans? Blueberry, Bubblegum, Buttered Popcorn, Chocolate Pudding, Coconut, Candy Floss, Green Apple, Island Punch, Lemon, Lemon Lime, Liquorice, Orange Sherbert, Peach, Pina Colada, Strawberry Daiquiri, Tangerine, Toasted Marshmallow, Tutti-Fruitti, Very Cherry and Watermelon. Or for those that like it sour, try the Sours Jelly Belly Jelly Beans with Sour Apple, Sour Orange, Sour Peach, Sour Raspberry, Sour Cherry, Sour Lemon, Sour Blueberry, Sour Watermelon, Sour Grape and Sour Strawberry. 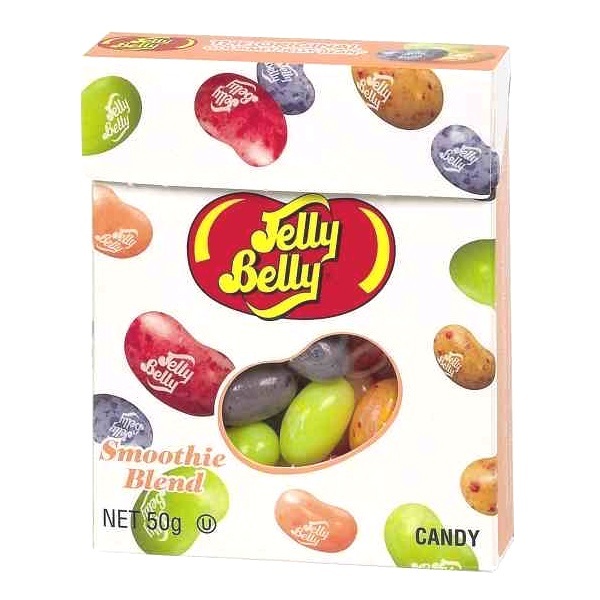 For those that like it smooth and fruity, you have to try the delicious Smoothie blend jelly beans from Jelly Belly. With tasty flavours including Pineapple Pear, Cherry Passion Fruit, Mandarin Orange Mango and Mixed Berry, they are popular with anyone with a sweet tooth. If you just can’t get enough of them you can now surround yourself with the sweet and mouth-watering smells of your favourite Jelly Beans with the fun and funky, gorgeous smelling Jelly Belly Scented candles by Wax Lyrical. Fill your home with the sweet smell of Toasted Marshmallow or Sizzling Cinnamon. There’s lots to choose from! If you’re spoilt for choice and can’t decide which delicious sounding Jelly Belly Candle to choose, we have random mixed packs so you can try them all and save money by buying in bulk at the same time. TAOS Gifts also has lovely little mini candle selection boxes containing 18 highly fragranced scented mini candles by Wax Lyrical, based on the delicious flavours of Jelly Belly jelly bean candy and a matching candle tray. For the serious Jelly Belly Jelly Bean fans we have the ultimate gift pack that contains all of your favourite products! The fruity goodness doesn’t end there! Totally immerse yourself in the divine Jelly Belly bath and shower gel, with a different flavour for every day of the week. There is even a Jelly Belly Lip Balm in four exciting flavours, choose either Blueberry, Water Melon, Bubblegum or Very Cherry. With their delicious flavours, wonderful aromas and stylish packaging in fun and funky colours Jelly Belly products are perfect gifts for all ages.